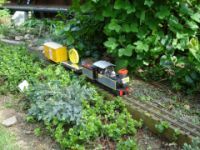 Somesay Island Railway/Chemin de fer de l’Ondit is a medium sized model railway, operating in a back garden. 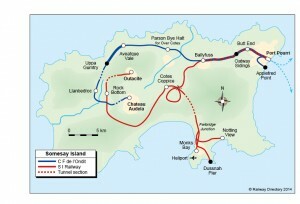 The main feature of Somesay Island Railway is that it brings together people of all ages to work and enjoy themselves. 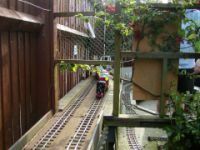 As with any railway, the trains run most smoothly when there is teamwork rather than rivalry, and where each player gets a chance to turn their hand to a range of activities in a variety of places. Not only will they be making the trains run, but they must ensure that they are loaded and unloaded to time, and passengers get to their destinations. Indeed the railway has featured in formal management team-building, and would be more than happy to do so again; always, that is, in return for continuing support for the invaluable work undertaken by Marie Curie Cancer Care. 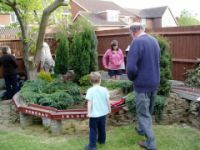 Visitors are invited to come and play their part in running this model railway on selected open days during the year, and to help raise money for MARIE CURIE CANCER CARE. Since 1998, operators and friends of Trains for Marie Curie have donated nearly £48,750 for Marie Curie Cancer Care, including more than £5,273 in 2012 alone. We would like to keep up this good work, so during 2016 we shall be holding further weekends of operations over the May Day and August Bank Holidays. We hope that there will be many volunteers to come and join in with operations, and to contribute to maintaining the work of Marie Curie Cancer Care. 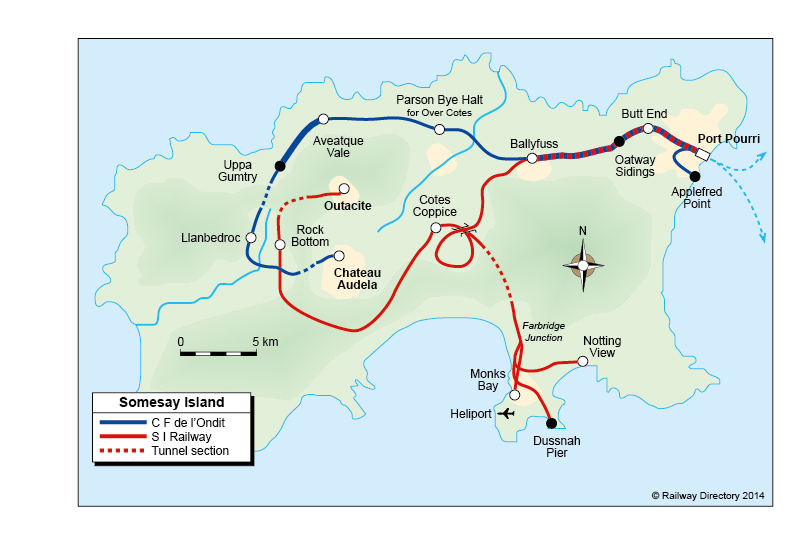 Built to approximately 1/24th scale, and running on 1¼” gauge (O gauge) track, Somesay Island Railway aims to reproduce the transport service for the imaginary Channel island of Somesay. 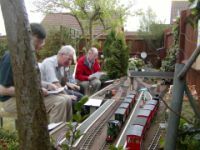 The layout is quite extensive, and can keep 20 plus people occupied with a whole range of railway operating tasks. As the opportunity presents, or maintenance requires, changes are made. In 2012 these affected Monk’s Bay (which was raised and totally re-designed) and Cote’s Coppice (where the baseboard was renewed and all the track re-aligned and re-laid). As one visit will only give time to experience half the system, return visitors can rely on some new challenge. In 2013 a new challenge will affect operations at Llanbedroc. Above all Somesay Island Railway is NOT a “don’t touch, stand and watch” railway. 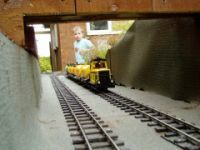 Both adults and children (biddable 7s and upwards) are definitely encouraged to “get on with it, and make the trains run” in an appropriate “hands on” way. We have only one absolute rule: “anyone causing collisions gets sent home”!